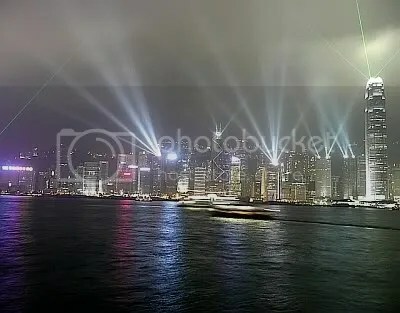 Every night at 8pm, Hong Kong’s skyscrapers shine spotlights and lasers from their rooftops in what’s billed as a “Symphony of Light”. Tourists line up along the harbor for the yawn-inducing light show, which benefits greatly from the ever-present smog that casts the city in a gray-green light during the day. 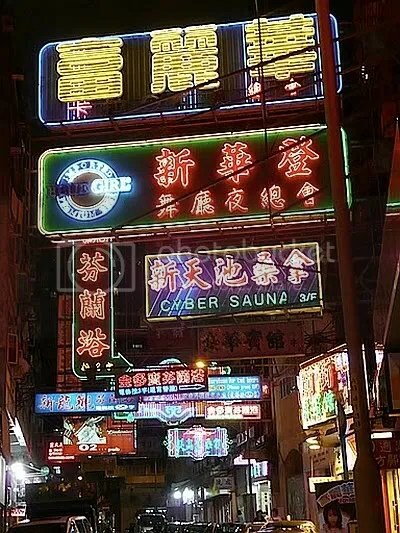 I took the ferry from the southern coast to the northern part of the city (Kowloon) while the show was happening–they tuned the boat’s PA system to the radio station which was broadcasting the music to which the lights were cued. 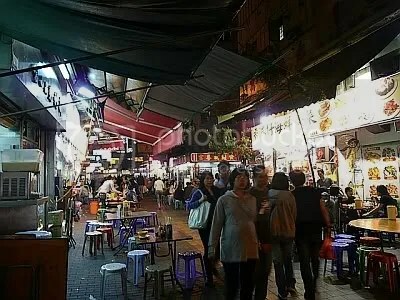 I caught a taxi at the ferry depot and went to the Temple Street night market, which was hopping at 9pm, but started to close up around 11pm. For sale are all varieties of strange produce, cheap plastic crap, clothing, antiques, jewelry, etc. Everyone I had to deal with spoke English or typed the price into a calculator. They were all open to negotiation. Fortune tellers were set up at one corner. There are loads of restaurants where you can pick your seafood dinner out directly from the tank, or get a bowl of steamy noodles to eat at picnic tables with plastic chairs. There was even a street lined with saunas, spas, and ladies in high heels. After two weeks in Beijing, I moved to the outskirts of town. I liked it better than the center, but I still didn’t love it. 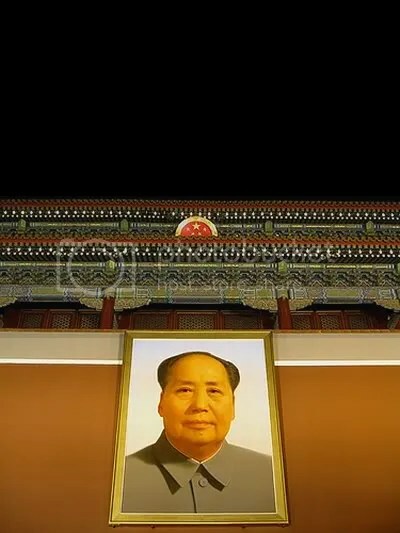 It is a city built for habitation by giants; by grinning, five-story-high reincarnations of Mao. It sparkles with new concrete, and its boulevards yawn, eight-lanes wide, crossable only by underground tunnels. Guard rails separate the sidewalks from the street, but you can tell they’re not there to protect the pedestrians: “This is car territory,” they say “You little bugs aren’t allowed in here.” Majestic latticework domes glitter above the skyline, and walking through downtown, one sees architectural wonders that only computers could dream of. 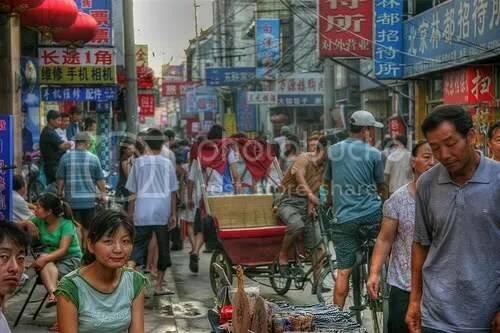 Beijing’s quaint, human-scale alleyways, the hutongs, are being torn down at a rate that you could probably measure in inches per hour. I had a friend in Beijing, a university student called Xing Wei, who had grown up in a small village in southern Jiangxi Province. In October of 2007, he invited me to spend Chun Jie, the fall festival, with him at his parents’ house, and having nothing particular to hold me in Beijing (or anywhere else in the world) I accepted. There are four classes of train-travel in China: in combination, soft or hard, seater or sleeper. When backpacking Westerners take overnight trains, they usually pay the extra 15-odd dollars to pass the night curled up in the comfort of one of the padded cubbies that are stacked three-high in the tall, closet-like cabins of the hard-sleeper cars; but for a Chinese boy from the provinces who lives on five dollars a week and whose parents only recently moved into a concrete house that doesn’t wash away during heavy rain-storms, that’s an unnecessary luxury. Yes, I offered to buy us both hard-sleeper tickets. Several times. We arrived well in advance of our train to commandeer a strategic position near the front of the lawless mob of travelers gathering in the waiting-area, at the Beijing West Train Station; but when we got to our car, it was already packed with men, women, and children of all ages, filling the seats, crouching and standing in the aisles, the doorways, the vestibules between cars. When they run out of seats in the hard-seater cars, the government keeps selling tickets at the same price but without a seat assignment. During the holiday season, the hard-seater cars of trains departing from major cities are thick with humanity and its detritus. We squeezed through the resulting morass of people, displayed our tickets to dislodge several earlier but less fortunately beticketed arrivals from our assigned seats, and settled in for the sixteen hour slog down through the smog-choked night of the Chinese heartland. The great national train-travel pastime of the Chinese is eating sunflower seeds. True, a bit of diversion can be got from such popular activities as “Look, the Foreigner Speaks Chinese! Talk to the Foreigner!”—in fact, they have tremendous patience for this endeavor, even when the foreigner in question turns out to speak rather limited Chinese—but, in the context of a 16-hour overnight in a hard-seater car, such games are short-lived. Eating sunflower seeds is eternal. Chinese train-stations and corner-stores sell several brands of sunflower seeds in numerous flavors, but the seeds come in their shells; and therein lies all the fun. Chinese people can shell a sunflower seed with their teeth—a skill that takes literally dozens of hours of train-travel to acquire—and it is the shelling, more than the actual eating, that really passes the hours. And then what do you do with the shell, once you have popped it off the seed? Why, you spit it on the floor of course! In America, we really have three grades of filthy, that we deal with on a day-to-day basis: floor, trash, toilet. In China, these are all, essentially, one. That situation is changing rapidly, and anyone in the rising, urban Chinese middle class would be furious about that last sentence, but the truth is that the floor-as-trash system is still largely in effect; and while floors are not normally used as toilets by adults, I’ve certainly been in bathrooms where little distinction is made between floor and squat-toilet; and many still consider the floor the proper landing-place for infant feces. At any rate, to the great piles of sesame-seed shells in front of every row of seats, add a scattering of orange- and palmello-peels, discarded chop-sticks, chicken and duck bones, empty paper soup-bowls, phlegm, plastic sausage-casings, etc. Periodically, a railroad employee comes through with an immense witch’s broom, like a bale of twigs bound to a pole, and sweeps all this away, in a breathtaking, bristle-driven exodus of refuse. But what amount of cultural difference, inconvenience, discomfort, or dirtiness could possibly detract from the supreme coziness of an overnight train ride? The crowded car, the halting conversations with strangers, the general unfamiliarity of it all only augmented and gave color to the delicious romance of the train rolling on through the night, the warm smell of the food-cart coming down the aisle attended by uniformed women with ladles, the wakeful sleep propped up on backpacks and suitcases pressed against strangers, the drowsy passing of unknown towns, the hushed commotion of people collecting their bags in the darkness of sleeping cars and disembarking onto empty, yellow-lit platforms. And when, at last, the blue-green of dawn fills the broad windows of the train, who can feel anything but excitement for the new day and the unexplored country? 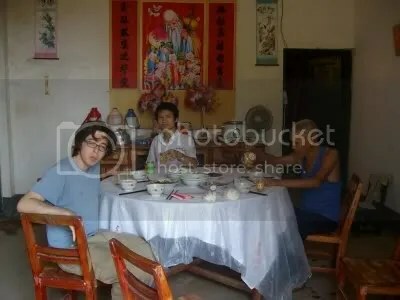 We reached Nankang in the evening and walked across town to the restaurant where Xian Wei’s mother worked 12 hours a day, seven days a week, to put him through college. Along dark streets, lined with shuttered shops, we passed, here and there, an open glass store-front, dimly lit with pink neon; in the bare and dingy interiors, three or four or five young women in jeans and turtle-necks would sit side by side on a lone couch, knitting. These, Xian Wei said, were prostitutes. Farther on, we came to an even emptier neighborhood. A blind alley lead off into impenetrable darkness, beneath the overhang of wooden awnings, crumbling masonry, indistinguishable vegetation. Just before we got to the restaurant, we passed a vegetable garden, sunk two feet below the level of the road and lined with a low brick divider. Alongside this, a narrow path lead off towards ramshackle brick tenements beyond. The restaurant was bright white and bustling. Xian Wei’s mother and her coworkers lead us past the main dining-room, through back hallways, to a narrow private room where they served us a feast of local delicacies. As was to happen many times over the next few days, and despite many attempts on my part, I was permitted to pay for nothing. The next day we met up with a pretty girl, who had shared a desk with Xian Wei in high school. She had asked him out, he told me, but at the time he had been too busy with schoolwork to think about girls; now, lonely-hearted in Beijing, he had developed a long-range crush on her—but, alas, she had a boyfriend! This girl was attended by a chubby college-buddy in a T-shirt that said “Ready for Boarding.” I asked her if she knew what it meant and she said, yes, it meant that you are ready to get on a train. I was too embarrassed to say anything. 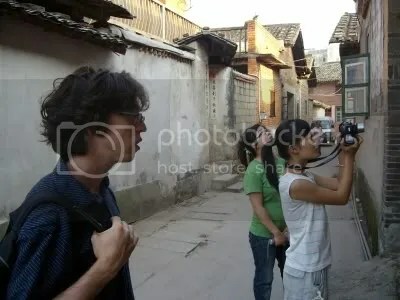 The four of us wandered the dusty streets of Nankang, through a maze of back-alleys that sprawled and twisted behind the buildings of the even city-blocks and, with their cracked and wild rambling, belied the modern storefronts and the well-paved streets. Alongside these alleys, and crossed by them on narrow dirt-paved bridges, ran black stagnant rivers in deep stone gutters, and all manner of garbage floated in them. We wandered past back-yard gardens and low crumbling walls, ruins of old buildings, the remains of a decaying older city woven in and between modern Nankang. As we walked, we collected a motley retinue of small, dusty children, come to follow the foreigner, as he walked piper-like through their city. If I turned to look at them, they would rush back around the nearest corner; but a moment later, they would glide back into view, to stand and stare awestruck, and the boldest among them would wave back when I waved. “I like this place!” I said to Xian Wei. “Yeah,” I said, “I like small, old, dirty places.” But this was an aesthetic so foreign that Xian Wei couldn’t even take it seriously. He only laughed and cocked his head at me, as if trying to tell if I was making fun.